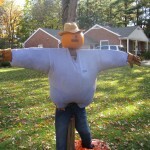 I’ve previously documented our Halloween scarecrow tradition. It’s something we enjoy, keeping it alive for at least 60 years now. Well, this year, I don’t know what to say . . .
Here’s the view from the other side (and yes, he’s doughy) . . .
And now the backside again, the view from the street . 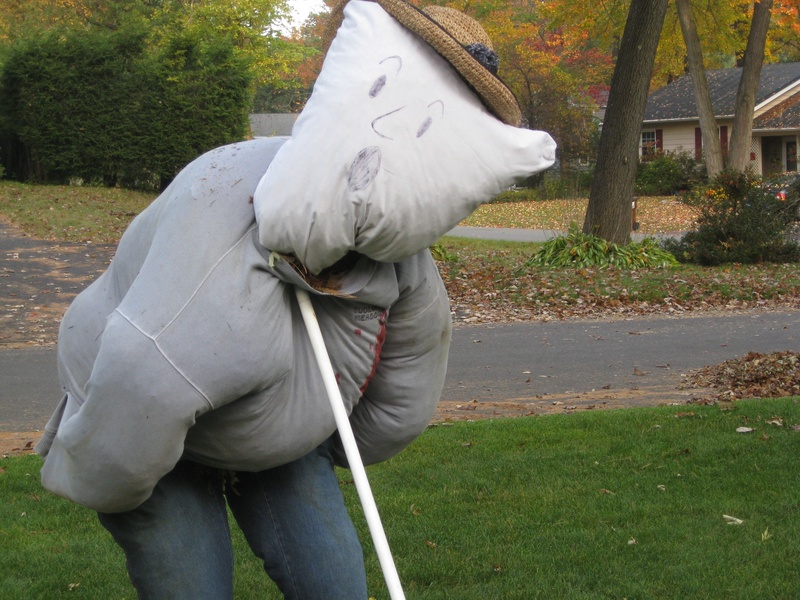 . .
It’s either the most awesome Preller scarecrow ever, or a serious lapse in taste. As for the old days, here’s a snap from 1953. 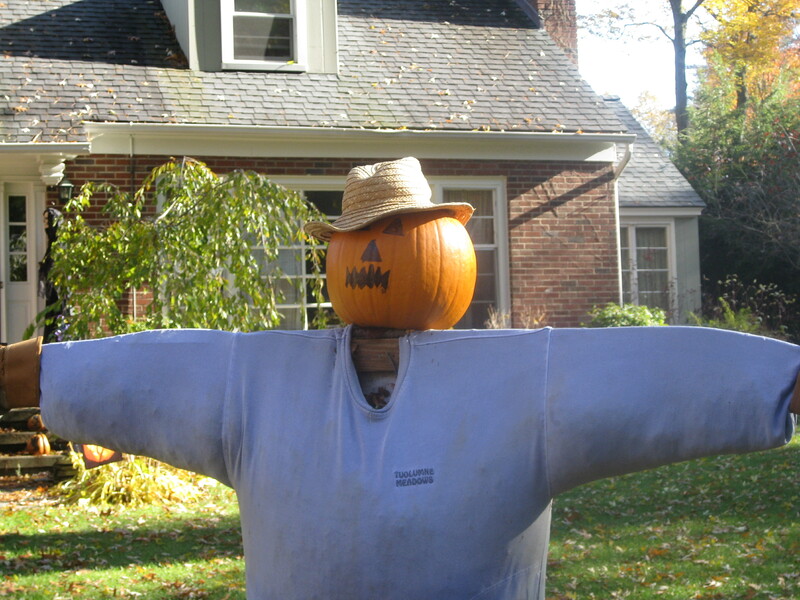 My father built these every year . . . This is about 20 years later, from the 70’s. It’s amazing, but most of our family photos are cropped this way. It’s hard to imagine why, or what was so difficult about keeping everybody in the frame, but there it is . . . This is a more recent example, 35 years after that, from my own front yard, thanks to a little (and I mean, a very little) help from my kids . 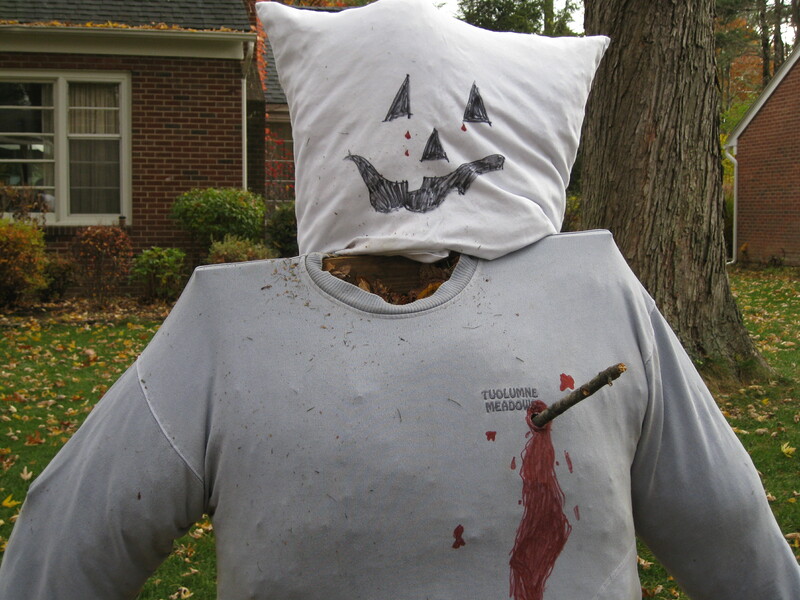 . .
Last year we experimented with the pillowcase head and gratuitous gore . . .
HEY, I JUST REALIZED . . . THIS IS MY 700th POST! 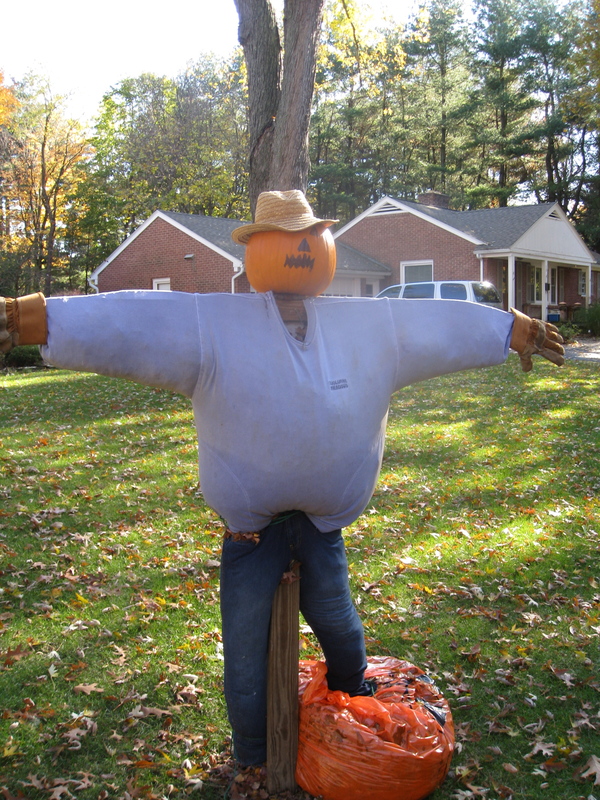 Some of you among my Nation of Readers may recall this post from October 30th, and the wonderful snaps contained therein, about the time-honored Preller tradition of building a Halloween scarecrow. Well. Recently my sister’s high school friend, Bruce Donnola (who, amazingly, went on to become !Bruce Donnola! 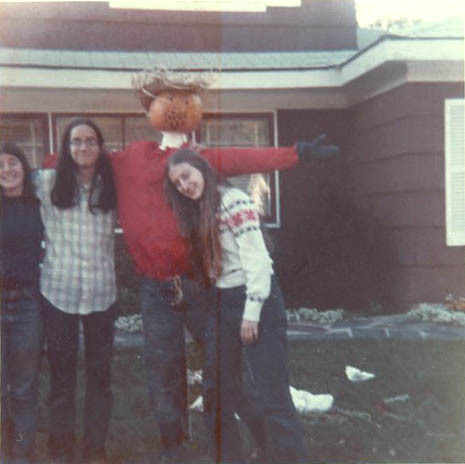 ), sent me this classic photo from 1973 — which varifies that I wasn’t lying about the whole scarecrow thing. 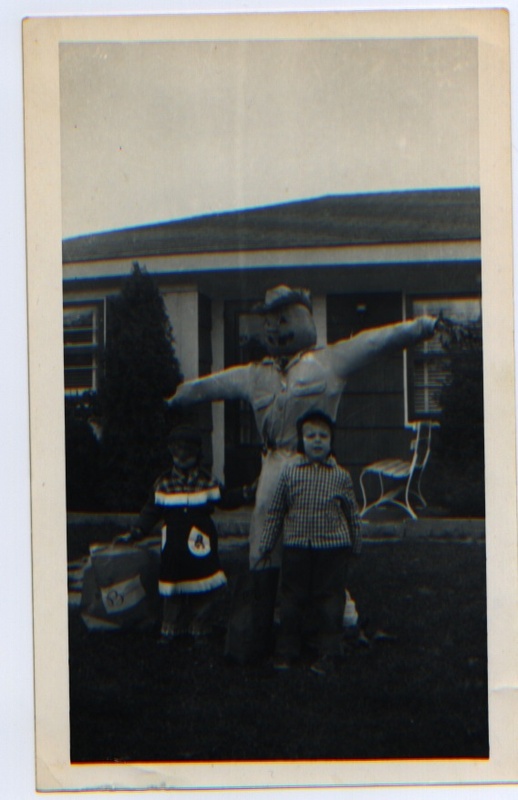 And if I ever get it scanned, I have another b/w one from what has to be from the ’50s — same scarecrow across six decades. Prellers. Don’t. Change. 1) That’s my sister Jean, or two-thirds of her, on the left; Bruce in the middle, with his cool long hair; and the lovely and talented Sharon Kosakoff, right. 2) Bruce claims that my mother took this shot. And after careful study, I can only say: looks about right. Pointing was never Mom’s bread-and-butter. In fact, come to think of it, bread-and-butter was Mom’s bread-and-butter. And a can of Campbell’s creamy mushroom soup poured over pan-fried boneless chicken breasts. 3) Behind them, look!, that’s my old house where I used to live! 1720 Adelphi Road, Wantagh, NY. I had the same phone number my entire childhood: 718-785-7379. There’s something really nice about that. 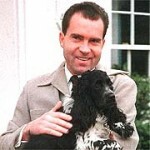 4) Nixon was President at the time of this photo. I remember him well. Believe it or not, Nixon’s dog, Checkers, immortalized in the legendary “Checkers Speech” of 1952, is buried in my hometown, right across from the Wantagh High School. We used to hang out there sometimes, cutting classes, just for the delicious teenage irony of it. 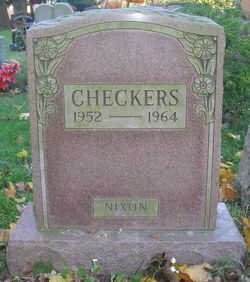 5) I place a key dramatic scene at this exact gravesite in my upcoming novel, Bystander (Fall, 2009). Just for the nostalgic irony of it. True story.